Dolphin Leisure present to you only the best in Hot Tub and Spa technology. Check out our fantastic range of Portable Spas and in ground spas for domestic and commercial customers. Easy to set up and simple to use and maintain, welcome to the world of Rotational Moulded spas. A light weight affordable alternative to the traditional acrylic spa. Fantasy Spas are manufactured to be portable, durable and affordable and only need a 13 Amp supply. 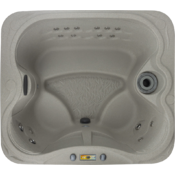 With a durable RokSolid shell, our spas are built to withstand the elements and will provide enjoyment for years to come. It's not just good to relax, it's essential for our general well being. The Olympic 21 is Catalina's biggest Swimspa yet! 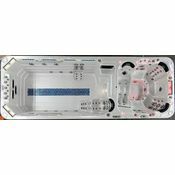 The pool includes 4 high power jet pumps that deliver a variable swim current through 3 purpose made adjustable river swim jets, whilst the hot tub features 5 seats & 1 lounger. Ultimate Luxury!